Spring has sprung and this year’s pests are active and feasting on your trees, enter the eastern tent caterpillar. The eastern tent caterpillar is a cool season insect which loves munching on the leaves of your tree. Tent caterpillars are not super destructive, but they can decrease the aesthetics of your tree. The black eggs overwinter on twigs of host plants. Caterpillars emerge toward the end of March (dependent on weather conditions) and begin constructing a web nest in the fork of a major branch. By mid-May, the larvae are ready to pupate. Moths emerge by mid-June at the latest. Tent Caterpillars are typically found feeding on trees in the Prunus genus (plums and cherries), or on Malas (apples and crabapples). The caterpillars hide in their silk “tent” during the day and emerge to feed under the cover of darkness. During the night they feed on the leaves which can defoliate the tree. This damage typically will not last more than 3 weeks before the trees have a flush of new growth. If your trees are healthy and you don’t care about the aesthetic damage caused by the insects you can do nothing. The easiest way to rid your trees of these insects is to pull the webs out of the crotch of the trees by hand. However, do this during the day when in insects are in the web. Sometimes chemical control is warranted. This can be done with any product labeled for caterpillars. Seriously read the label, you could cause a lot of damage if the chemicals are applied inappropriately. If you need help controlling eastern tent caterpillars or another pest contact us! Eastern tent caterpillar in a crabapple tree. 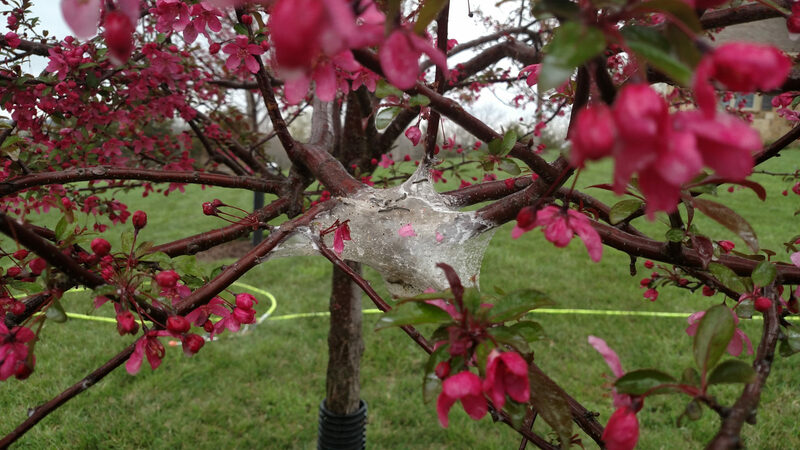 Tent caterpillars in a crabapple tree. Note that the web is in a crotch of the tree.